Univ. of Maryland/A.S. Wilson et al. The Eyes on the Skies is a movie produced as standard DVD and Blu-ray format, freely available for TV broadcasters and for public events carried out by educators, science centres, planetariums, amateur astronomers etc. (send your email, postal address plus a justification to us ). 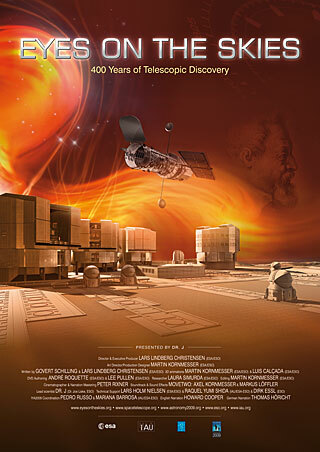 It explores the many facets of the telescope — the historical development, the scientific importance, the technological breakthroughs, and also the people behind this ground-breaking invention, their triumphs and failures. It is presented by Dr. J, aka Dr. Joe Liske, a professional astronomer from the European Southern Observatory and host of the Hubblecast video podcast. 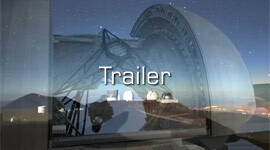 The DVD runs for 60 minutes and contains subtitles in several languages. The movie may be used by TV stations for broadcast for free, but only if the full movie is shown including the major part of the credits. 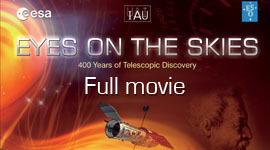 Parts of the Eyes on the Skies movie may be shown in connection with features on the International Year of Astronomy, but only if the Eyes on the Skies movie or book are mentioned visibly or audibly. If you are interested in translating them into another language and having it included in the next edition of the DVD, please use the English .txt files provided on the link above as an example. Save your the individual files in plain text format using UTF-8 encoding (for instance in Microsoft Word with save as -> text -> UTF-8). Please use the same formatting, keep the timecodes and don't change the number of lines. Then send the files to us and we will reply as soon as we can. 24–28 October 2011, International Festival of Popular Science and Educational Films "World of Knowledge", St.-Petersburg, Russia. 7–10 September 2011, AARUUSH'11, SRM University, Chennai, India. 2 April 2011, Washington State Science & Engineering Fair, Bremerton, Washington, USA.